The Adjustable Gemtrac is 120" W x 81" H x 30.25" D with a 42" aisle and has adjustable shelving to accommodate up to 3,500 DLT/SDLT in plastic cases. Two cabinets are linked by steel overhead tracks. 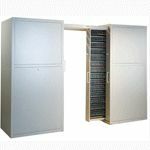 Enclosed- cabinet design protects against dust, light and sprinklers. Additional features include heavy-duty rollers, all-steel construction, leveling glides and powder coat finish. Installation not included. Combine this reward with the TapePower installation reward to ensure your rack is properly installed and configured.